Praise poured in Monday for deceased North Slope Borough mayor and Inupiaq whaler Edward Itta, with prominent leaders remembering him as a "world-class politician" and "giant of Alaska" who possessed a rare ability to unite opponents across the political spectrum. Itta, 71, died peacefully Sunday in Barrow after battling cancer. He was surrounded by family, relatives said. "Edward Itta opened my eyes to the wonders of the Arctic and its people," said Ken Salazar, former U.S. Interior secretary under President Barack Obama. "He was a giant of Alaska in my mind and someone who I will always treasure." Gov. Bill Walker and Lt. Gov. Byron Mallott praised Itta's "charismatic and visionary leadership." "While Edward will be greatly missed by many, his achievements and contributions to Arctic policy and the state of Alaska will long be remembered," they said in a statement. "Our hearts goes out to his wife Elsie, their children, and grandchildren for their loss." Known for delivering powerful speeches on tough issues, Itta became an influential figure on the North Slope, serving as mayor from 2005 to 2011 in the sprawling region at the northernmost edge of the United States, where most residents are Alaska Native. "His leadership, wisdom and service brought enormous success and pride to the people of the North Slope," said Harry Brower Jr., the current borough mayor. "We are all beneficiaries of his legacy, and I express my heartfelt condolences to the Itta family." Friends and family said that Itta, a former subsistence whaling captain, will best be remembered for striking a balance between protections for bowhead whales and other animals central to North Slope life with the economic potential of the oil and gas industry that provides revenues for modern services in the region's eight villages. Andy Mack, commissioner of the Alaska Department of Natural Resources, spoke Monday morning in a choked-up voice about working as an adviser to Itta during Itta's six years as borough mayor. "We were very close and he was a wonderful man," Mack said. 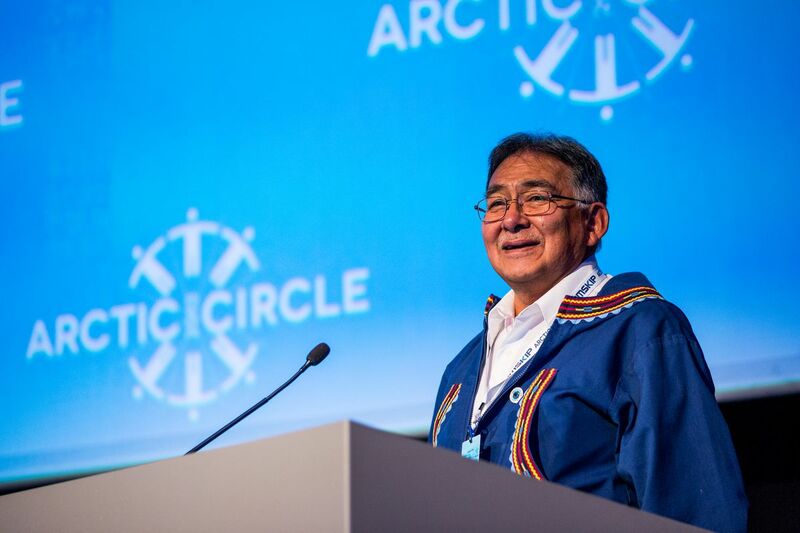 Nationally, Itta may best be known for his work as mayor that helped oil giant Shell move forward with controversial plans to drill in the U.S. Arctic Ocean. After two decades without oil exploration in the region, Shell began drilling offshore in 2012 after Itta called for strong protections for the ocean. "He came to the conclusion that if done carefully, activity should move forward in the outer continental shelf, but he wanted folks to be really careful," Mack said. "He wanted to make sure that things weren't done too quickly because you might make a mistake and harm things happening in the water." Itta's views were featured in a book by Bob Reiss published in 2012, "The Eskimo and the Oil Man: The Battle at the Top of the World for America's Future." The book highlighted Itta's efforts to balance wilderness protections with development as Shell moved ahead. More recognition followed in 2012, when President Obama appointed Itta to the U.S. Arctic Research Commission. Salazar said in a phone interview on Monday he'll never forget meeting Itta in 2009 in Washington, D.C. Their first meeting was scheduled to last half an hour, but Itta was so fascinating it went on for two hours. Nearly every year after that, Salazar said, he "had the honor" of visiting Itta in Barrow and spent time at his subsistence camp outside of Barrow, a city of 5,000 that is changing its name to the Utqiagvik, its Inupiaq name, on Dec. 1. In recent years, Salazar and Itta talked frequently by phone, family said. Itta spoke to Salazar from his hospital bed a few days before he died — Salazar had called to see how he was feeling. Itta was lucid and spoke movingly about his love for Alaska and its Native people, Salazar said. Like other North Slope leaders, Itta rose to prominence from humble beginnings. He was born in Barrow in July 1945 to Noah and Mollie Itta. Much of his childhood was spent with siblings at camps on the tundra and sea ice as the family fished and hunted for seals, walrus and whales, said Dorcas Stein, a sister. Itta graduated from Mt. Edgecumbe boarding high school in Sitka in 1964 and trained as an electronics technician at a Cleveland school and in the U.S. Navy. His first job took him to Prudhoe Bay as an oil field roustabout, his family said. As director of the borough's Public Works department starting in the 1980s, Itta was key to the effort that modernized North Slope villages that once lacked running water and sewer services and other amenities, said Richard Glenn, a vice president at Arctic Slope Regional Corp., the North Slope regional Native corporation. "He presided over some of the greatest improvements to the physical infrastructure of the borough, when we went from rough-and-tumble, ramshackle villages to the more modern communities we see today," Glenn said. Itta grew up knowing the challenges of life without those services and understood that some development was needed to pay for them so they could be enjoyed by future generations. But Itta was also willing to take on organizations he saw as overly supportive of industry. Speaking in an interview in the New Yorker magazine in September about Inupiat communities' dependence on fossil fuel development while facing a different world because of climate change, Itta blasted ASRC for being too cozy with industry when it came to offshore development. Itta rode a "razor blade of balance," crossing political lines to meet with all sides, Glenn said. He sought input from younger residents, too. "He spanned generations that way," Glenn said. "He knew that what we needed to keep our culture going are the folks who look back and the folks who look forward. Otherwise we're just a bunch of stratified individuals." Among other accomplishments as mayor, Itta launched programs encouraging student leadership and healthy, community-based activities, his family said. Itta also served as board president for the North Slope Borough School District, president of Inuit Circumpolar Council-Alaska and a representative for Alaska on the Outer Continental Shelf Policy Committee. He was also president of the Barrow Whaling Captains Association and a vice chairman of the Alaska Eskimo Whaling Commission. Friends said Itta had a powerful way of addressing tough issues publicly, including in a speech before the Alaska Federation of Natives in 2006 that drew a rare standing ovation. Itta urged people to talk openly and honestly to find solutions to deep-rooted alcohol and drug abuse facing some Native communities, Mack said. "He'd say things people were less willing to say and do it in a graceful and kind way, but he'd put things on the table that were uncomfortable but important to talk about," Mack said. David Hayes, a former deputy Interior secretary under Salazar, met with Itta several times on a variety of issues, including Shell's pursuit of its offshore plans. Hayes said he was extremely impressed with Itta's "remarkable leadership." Hayes, now a distinguished visiting lecturer at Stanford Law School, said he was deeply saddened to hear about Itta's death. "I was always struck with how wise and spiritual he was and how deeply he thought about the serious issues facing his constituents," Hayes said. "I also personally think he was a world-class politician in the best sense of the word, in his effectiveness, communicating directly with people directly and forthrightly and in engaging in dialogue with all points of views." Senate President Kevin Meyer, R-Anchorage, and Sen. Donny Olson, D-Golovin, said in a joint statement that Alaska has lost a "great leader." "Alaska has been profoundly changed by the work Mayor Itta has accomplished on behalf of our great state and the Alaskans he has represented," their statement said. Itta is survived by his wife of 37 years, Elsie Hopson Itta, two children and six grandchildren. A service honoring him will be held Thursday at 1 p.m. at the Cornerstone Community Church in Barrow, following a visitation that begins at noon. "There will never be another visionary leader of his stature and his understanding," said Stein, his sister. "But the thing that is foremost in my mind was his diplomacy. He could work with all kinds of people, whether higher or lower. He just acted like himself."